Dark beauty. It's small. It's a premium product. And it's fast. We almost don't dare to call the new Zenbook UX301 an "ultrabook", as it attempts to be much more than that: the perfect mobile companion. With the top-notch materials, great build quality and high-end innards of its newest flagship; Asus wants to dethrone its fiercest competitor, Apple. The price point? That topic almost becomes a minor matter. 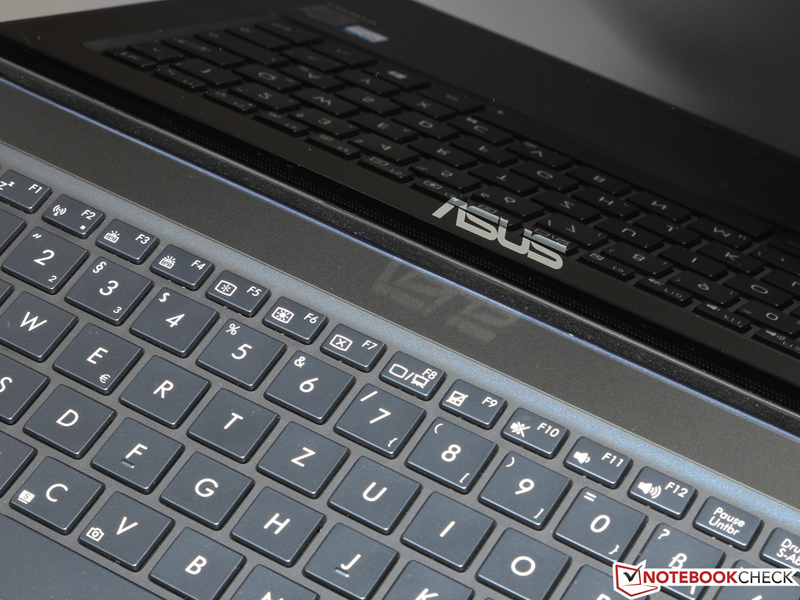 Everything began two years ago with the UX21E and the UX31E, Asus' first two ultrabooks which laid the foundation for a new high-end series - the Zenbooks. Much has changed since 2011: Sandy Bridge CPUs came and went, only to be followed by the more powerful Ivy Bridge chips. New variants such as the UX51VZ diversified the product portfolio. 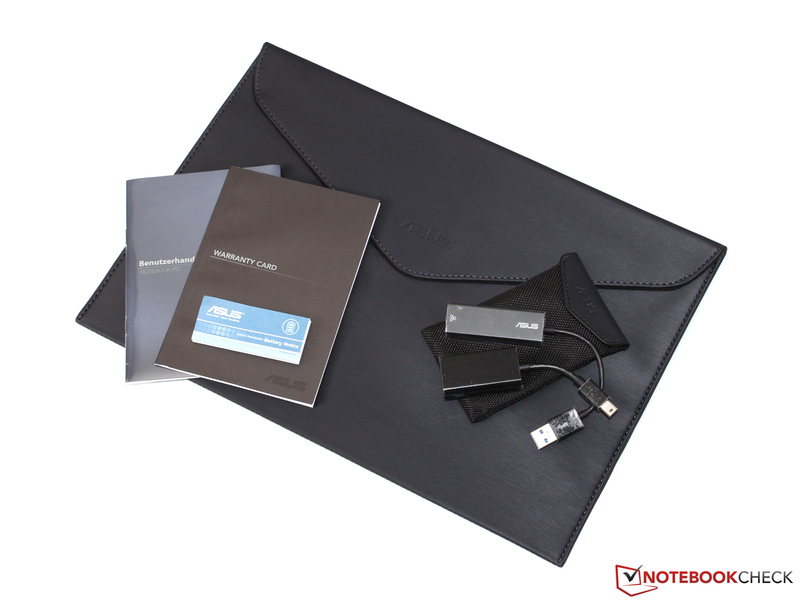 But, one thing remained true: Zenbooks still stand for luxurious hardware, premium materials and supreme mobility. 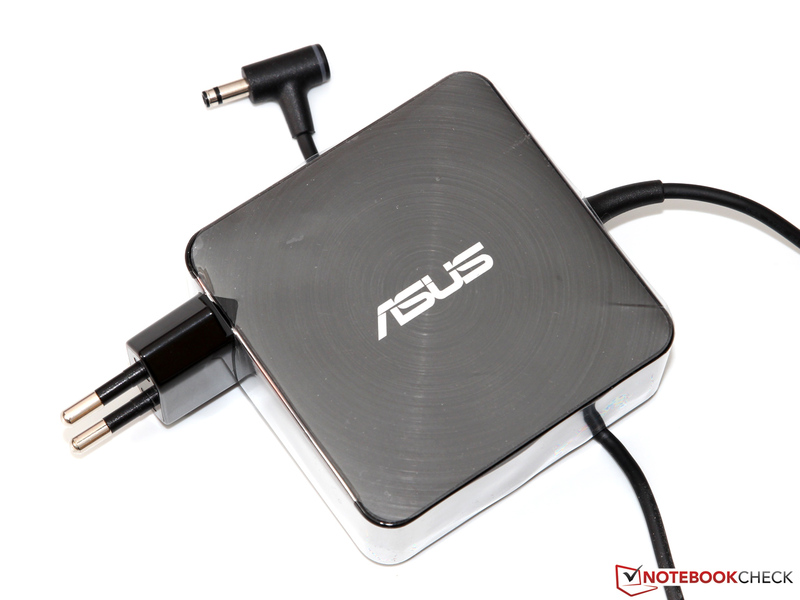 Asus has built itself such a premium brand that new superlatives have to be found in order not to lose its reputation. This is where the recently presented Zenbook UX301LA (also called Zenbook Infinity) is supposed to come into play. The specs sure look pretty: The UX301 is one of the first notebooks ever to make use of Intel's new Core i7-4558U, a more powerful Low Voltage CPU with the fast Iris Graphics 5100. 8 GB RAM, a 256 SSD RAID system and - last but not least - a 13.3-inch IPS display with multi-touch and an almost insane resolution of 2560x1440 pixels help to turn the UX301 into an outstanding device, at least on paper. So where do we even find suitable competitors? Even such a premium brand as Apple only offers less well-equipped (MacBook Air 13) or much heavier alternatives (MacBook Pro 13 Retina). 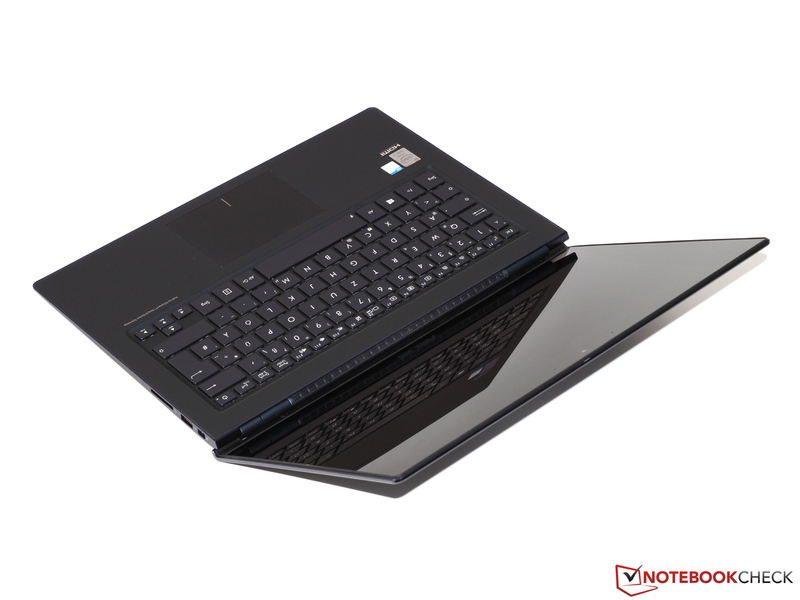 Thus, the Zenbook more or less creates its own class - an impression that is only corroborated by its price point. Approximately 1800 Euros (~$2450) may be fair, but it is still quite a lot. So let us have a closer look at one of the most exciting reviews of 2013. 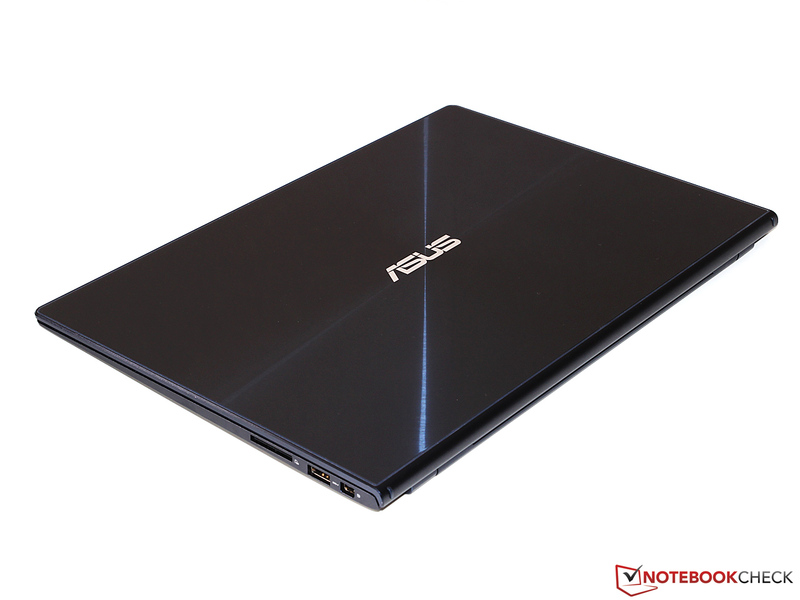 The Zenbook UX301 is one good-looking device, that is for sure. 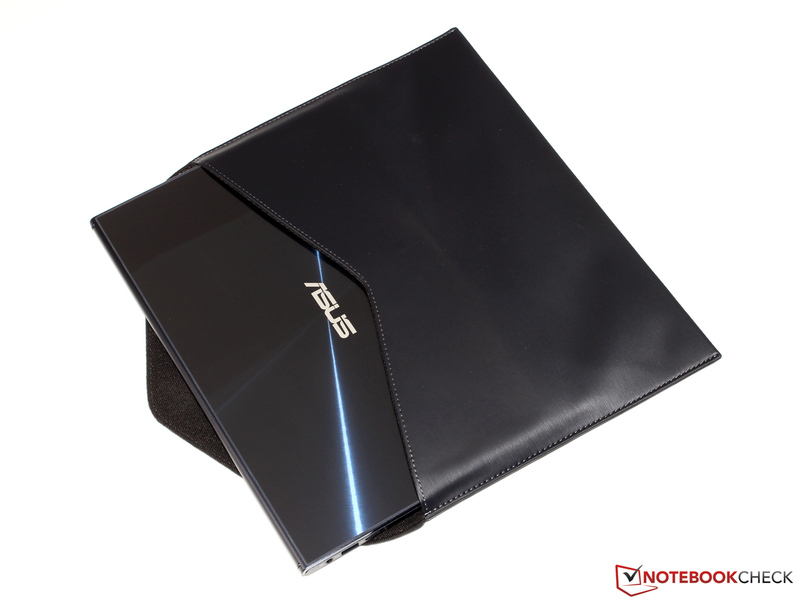 Asus has decided in favor of a dark, bluish-blackish color scheme, which definitely helps in making it look like the premium device it is. Some might be disappointed by the rather "plain" design (with chrome elements, LEDs and so on being notably absent), but we were definitely impressed. Another great thing about the UX301 can only be noticed when using it: With a thickness of no more than 15.5 millimeters (~0.6 inches) and a weight of just 1.4 kilograms (~3.1 pounds), this is perfectly on par with Apple's MacBook Air 13 - thanks to the widespread use of aluminum. Luckily, this diet does not mean that the Zenbook is not a sturdy beast. The case is actually not only torsion- but also pressure-resistant, even when a lot of force is applied. The same more or less holds true for the display lid as well, although it cannot possibly be quite as rigid as the base unit due to it being just 4 millimeters (~0.16 inches) thick (this does not pose any problems during actual usage). The display hinges can easily be opened with just one hand and they barely wobble afterwards. Asus uses not only one but two premium materials: Next to the aluminum frame, almost all surfaces (and not "merely" the display itself) have been covered with Gorilla Glass 3. Thanks to its glossy glass surface, the back of the display lid is supposed to be almost immune against ugly scratches - at the same time, though, it does also become vulnerable to fingerprints, requiring constant polishing. 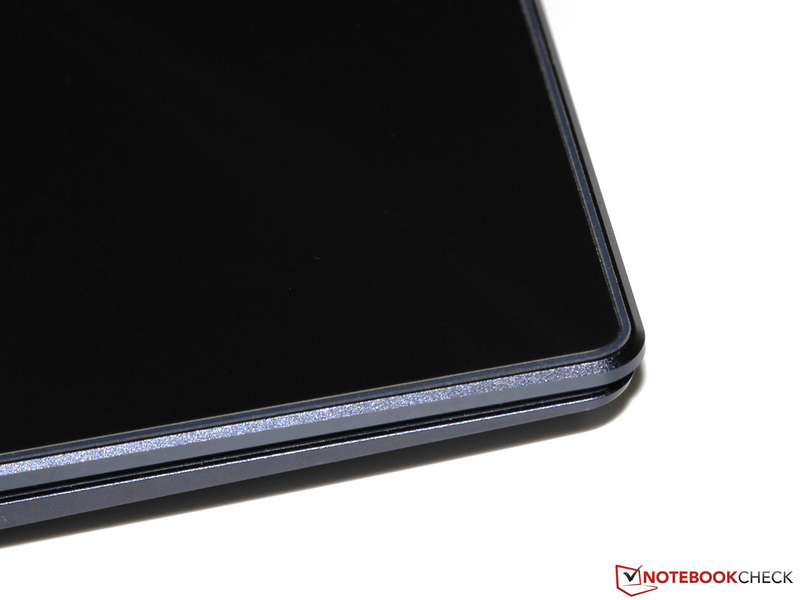 The palm rest, on the other hand, also makes use of Gorilla Glass, but this time it comes with a matte finishing, leading to an excellent feel of this part of the surface. Generally speaking, there are no weaknesses to be found in terms of build quality, design language and materials, even when looking at miniscule details. 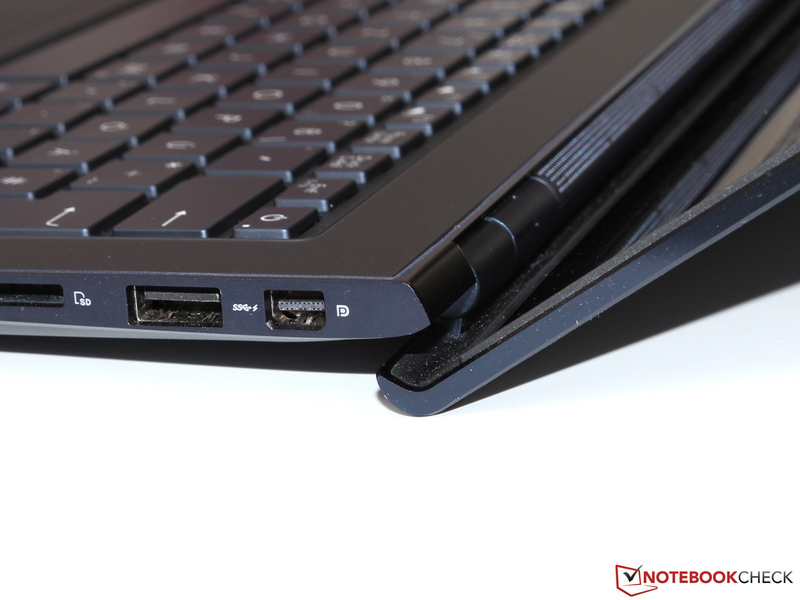 As is the case for most ultrabooks, the UX301LA only sports a small selection of ports. Still, all crucial aspects are thought of. Two USB 3.0 ports should be enough in most cases (albeit being a step backwards when compared to the three USB 3.0 ports of last year's UX32VD). 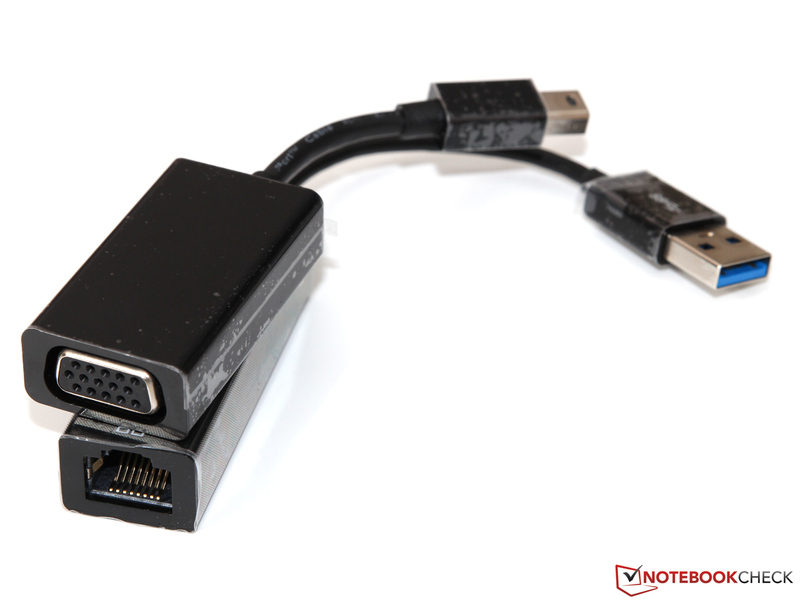 Both micro HDMI and Mini DisplayPort are on board, with the latter being useable as a VGA port as well via an included adapter. A second adapter turns one of the precious USB ports into a Gigabit Ethernet port. All ports (including the Line In/Out port and a SD/MMC card reader) are located at the rear of the left and the right hand sides of the device. Thus, none of them are in the way when using a mouse - neither for right-handed people nor for left-handers - while still remaining easily accessible. 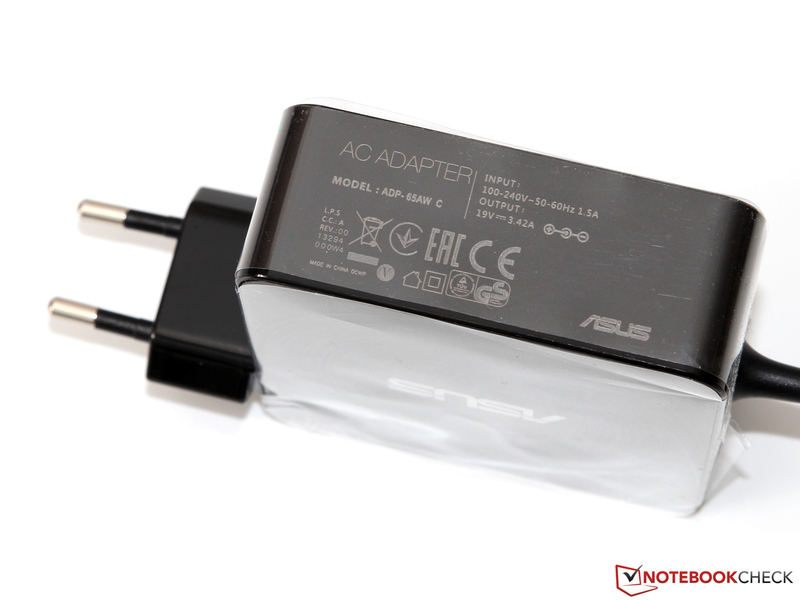 Intel's Wireless-AC 7260 is one of the best Wi-Fi adapters currently available. It comes with all standards, including the most recent 802.11ac, is compatible with Intel's Wireless Display technology, offers dual-stream (2x2) as well as dual-band support (2.4 GHz and 5 GHz) and reaches a gross data transfer rate of up to 867 Mbit/s. During our review, we tested these claims with an 802.11n router, resulting in superb transfer speeds, but only average Wi-Fi range. The Zenbook also comes with Bluetooth 4.0, but neither integrated UMTS nor LTE modems are available, not even optionally. Surprisingly, the webcam (0.9 megapixels) does not quite fit in with the rest of the innards. Its mediocre image quality does not seem adequate in such a premium laptop - washed-out colors, blurry pictures and a good deal of noise are quite a disappointment, both for photos and videos. At least, the array microphone offers great audio quality with crisp, clear voice rendition. 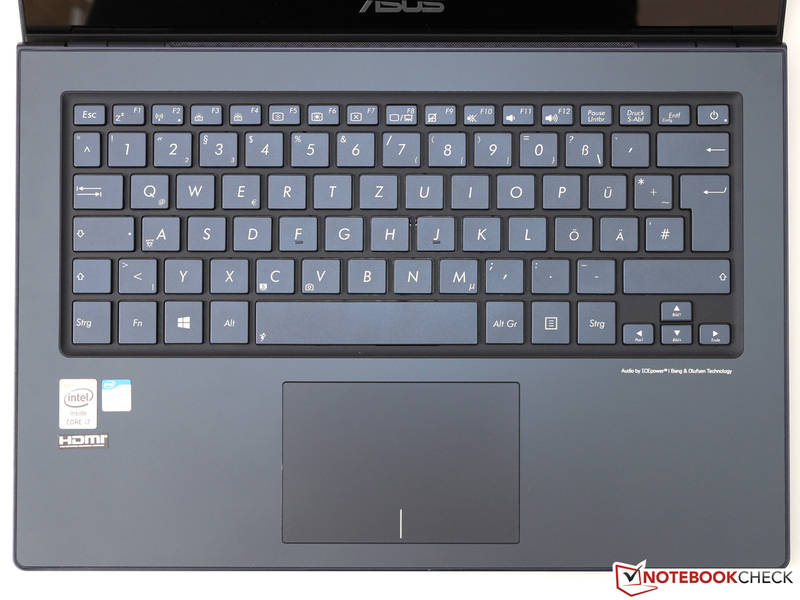 While most recent laptops did not ship with anything else but the bare essentials, Asus does a much better job with its Zenbook UX301LA: Next to the power adapter, there are also two adapters (VGA and Ethernet), a cable binder and a premium-looking laptop case that reminds us a bit of aluminum. On the software side of things, a number of tools - such as the Power4Gear utility that can be used to configure a number of energy-saving options - are included. Unfortunately, unnecessary trial versions and links to ads are included as well, although these can be removed with some effort. While it is not easy to do, it is certainly possible to remove the bottom panel of the device by loosening all T5 Torx screws (two of them are hidden beneath the rear feet). The front part of the panel can now be lifted while the rear part seems to be glued (or otherwise fastened) to the device and thus is not so easy to remove. It might not be worth it anyway. 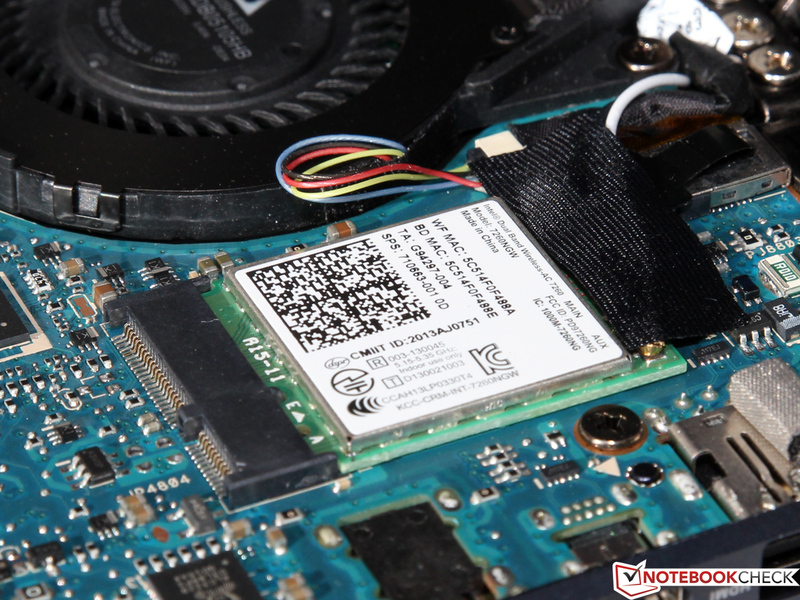 Most components are soldered to the mainboard (RAM) or use exotic connectors (SSD: M.2/NGFF 2260). Thus, only the Wi-Fi module could be swapped (in addition to the fans being cleaned). The UX301 comes with the usual 24 months of Pickup & Return Service. A Warranty Extension Package (WEP) can be purchased online at asus.com, boosting this to 36 months. Since this option is the same for almost all Asus notebooks, it appears to be quite the bargain: 60 Euros (~$82) is not that much when compared to the price of the Zenbook. The backlit chiclet-style keyboard of the UX301 has not changed much in terms of layout and design when compared to its predecessors. Haptics, build quality, and especially stability - everything about the 15x15 millimeters sized keys has stayed just as good as it was. The keyboard neither bends nor wobbles, even when typing frantically. Key travel is actually a bit longer than is usually the case for ultrabooks, but we do actually see this as an advantage. 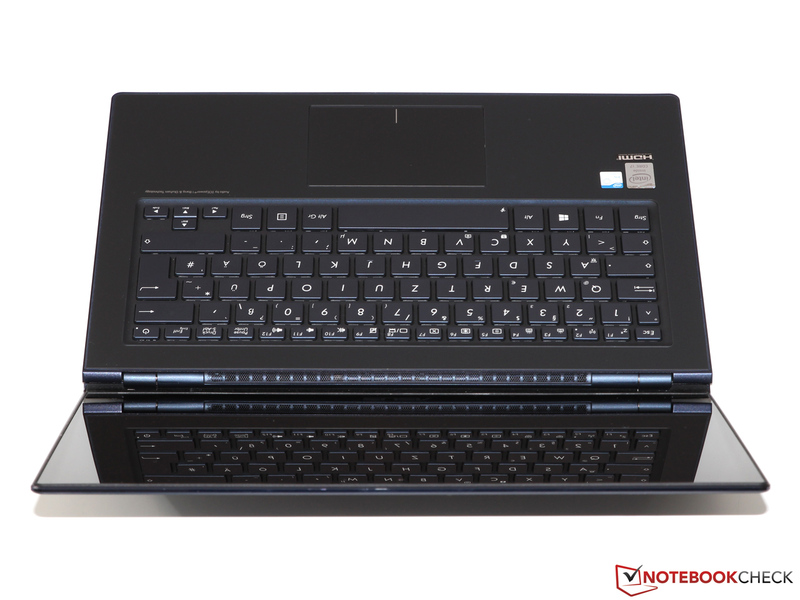 Writers and office workers will also be happy to hear that the keyboard comes with a firm and extremely precisely defined pressure point so that no external keyboard will be necessary, even in "office mode". In addition, the keys remain very quiet, corroborating our great first impression. As is the case with the competitors made by Apple, the touchpad of the UX301 comes with a matte glass surface with a velvet feel. It is amply sized (9.9 x 6.7 centimeters/~3.9 x 2.6 inches) and offers not only great haptics, but also useful multi-touch gestures, turning the Zenbook into a fully useable machine even without an external mouse. 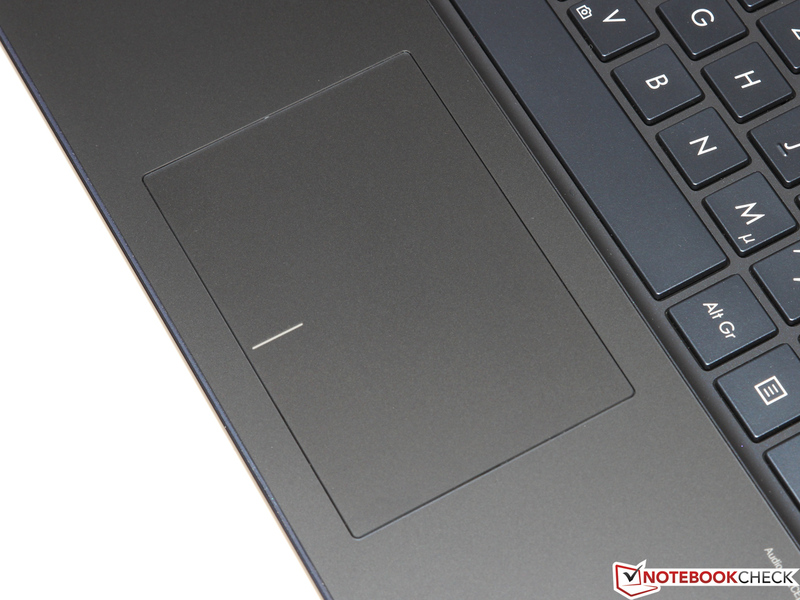 Following the current trend of removing dedicated mouse buttons, Asus ships the Zenbook with a so-called ClickPad where some areas of the touchpad are defined as left- and right-click areas, respectively. 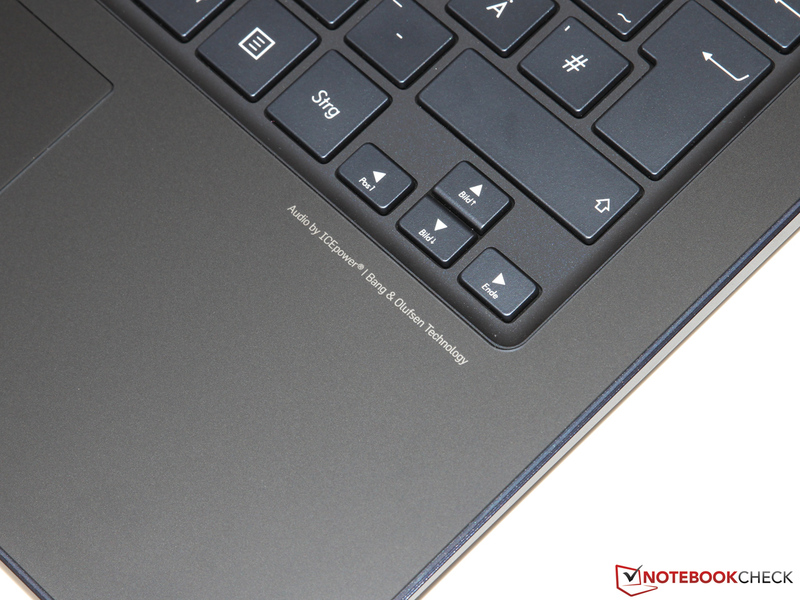 In contrast to many other notebooks, this actually works very well on the Asus Zenbook - even soft presses are enough to register as a click (with a rich thud), thus facilitating even complex maneuvers such as drag-n-drop. 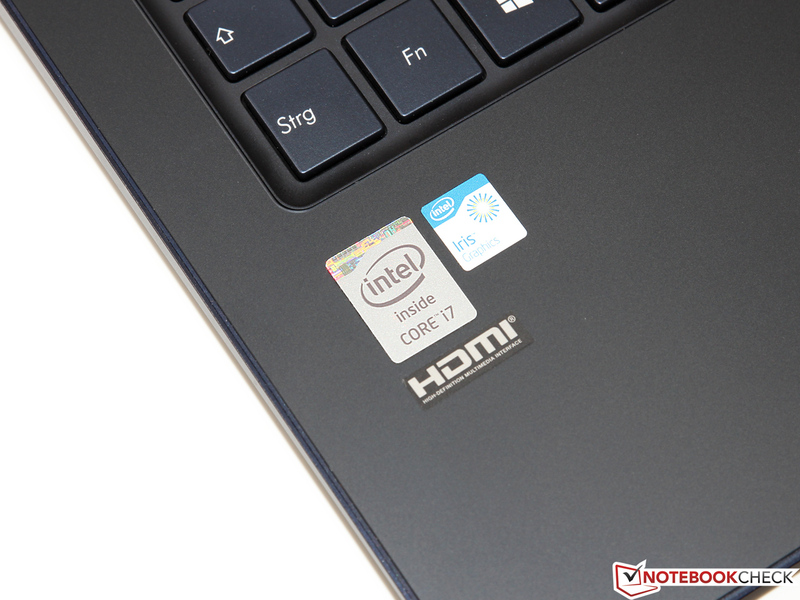 Intel requires all manufacturers producing Haswell-based laptops to include a touchscreen - that is, if they want to obtain the prestigious "ultrabook" label. While this might be extremely useful in the case of convertibles such as the Dell XPS 12, we are in doubt whether this provides an actual benefit for conventional laptops. 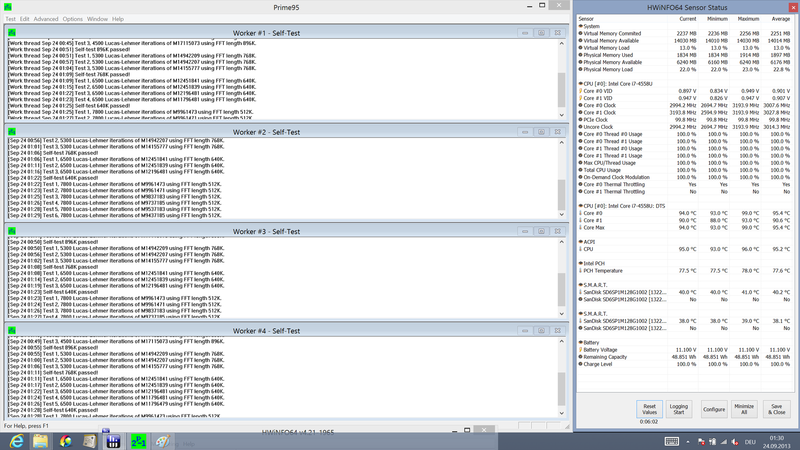 After all, Windows 8 can still be controlled most efficiently with a mouse and a keyboard. In addition, touchscreens almost always are synonymous with highly reflective glossy displays. 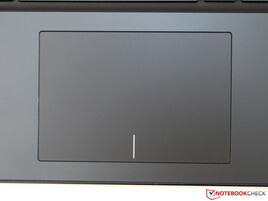 Apart from this (slightly subjective) point of criticism, Asus has done everything right: The capacitive multi-touch panel offers the kind of precision and low latency that we have come to expect from several high-end competitors. 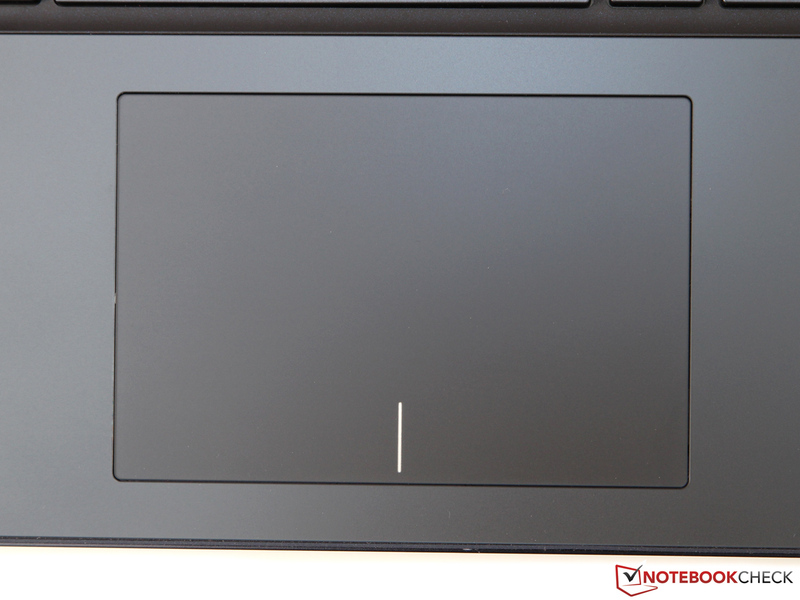 Just one year ago, we praised the Zenbooks UX32VD and UX31A for their high-resolution Full HD panels. Nowadays, 1920x1080 pixels are actually quite common - at least for mid-tier to high-end ultrabooks that sell for more than approximately 900 Euros (~$1225). It seems this was the reason why Asus improved the resolution once more, to 2560x1440 pixels. This comes down to a pixel density of 221 dpi - right on par with the MacBook Pro 13 Retina (227 dpi, 2560x1600 pixels, aspect ratio of 16:10). Moreover, this almost insane resolution is not even the end of the flagpole: Samsung's ATIV Book 9 comes with 3200x1800 pixels (276 dpi, same 13-inch diagonal). We are not sure whether this offers any advantages during actual usage - subjectively, we are hard pressed to find truly noticeable differences between Full HD and WQHD such as on the Zenbook. Even the smallest fonts are extremely sharp, at least from a normal viewing distance. In addition, Windows 8 is still not capable of scaling absolutely all content and all elements, depicting parts of the UI as tiny objects. 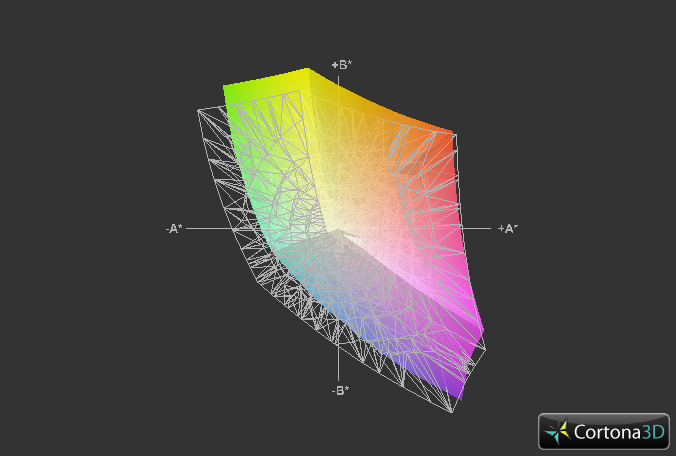 The display is equipped with a powerful LED Backlight. Its fantastic average brightness of 358 cd/m² is as good as that of its predecessor, and far ahead of both the MacBook Pro (307 cd/m²) and the MacBook Air (277 cd/m²). While a brightness homogeneity rating of 71 percent is nothing to write home about, this was not really noticeable during real-life usage. Of course, the UX301LA does not ship with a cheap TN panel. Instead, it comes with a premium IPS panel made by Sharp. Not only is the resolution top-notch: An impressive contrast ratio of 2138:1 due to its equally impressive black levels of 0.196 cd/m² is much better than anything the competition has to offer. 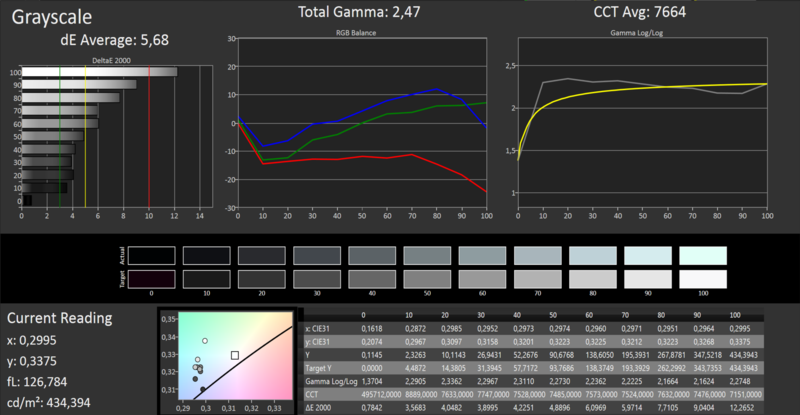 Even high-end devices rarely exceed the range between 700:1 and 1000:1 (MacBook Pro 13 Retina: 836:1). The display is already well calibrated in its delivery condition. Its small color deviations (Delta E: 4.9) occur mainly for shades of yellow and blue. Similar deviations (Delta E: 5.7) occur for the gray levels. 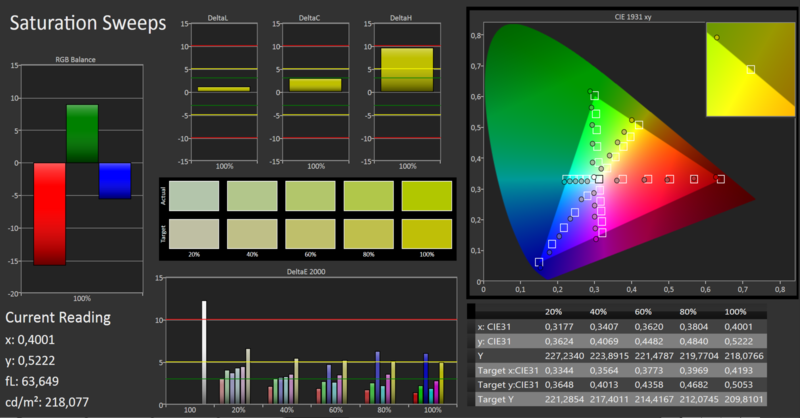 The sRGB color space is narrowly missed, but still, color space rendition is good enough so that photographers and graphic designers should be able to work with the device. Due to the reflective "glossy" display, the Asus struggles a bit during outdoor usage, especially in direct sunlight (readability suffers a lot due to the strong reflections all over the screen). 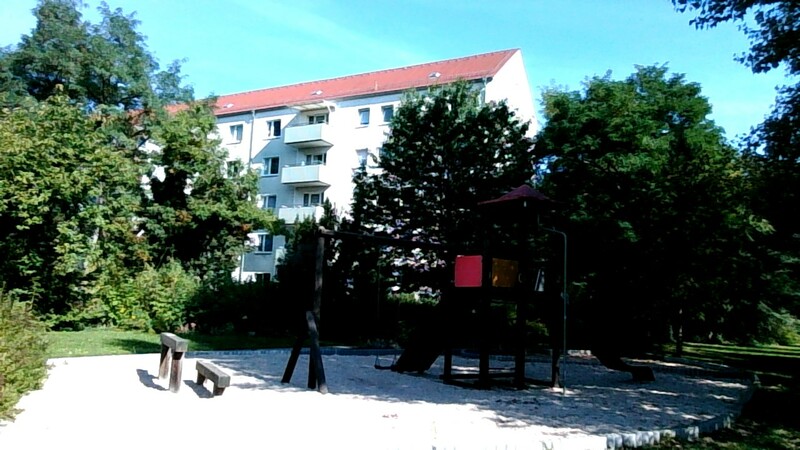 Nevertheless, thanks to its high maximum brightness, the UX301 does remain perfectly useable in the shade. As is the case with VA or PLS panels, IPS displays come with extremely wide viewing angles when compared to TN-based competitors such as the MacBook Air. No matter from where we look - apart from a slight reduction in contrast, no degradations occur. 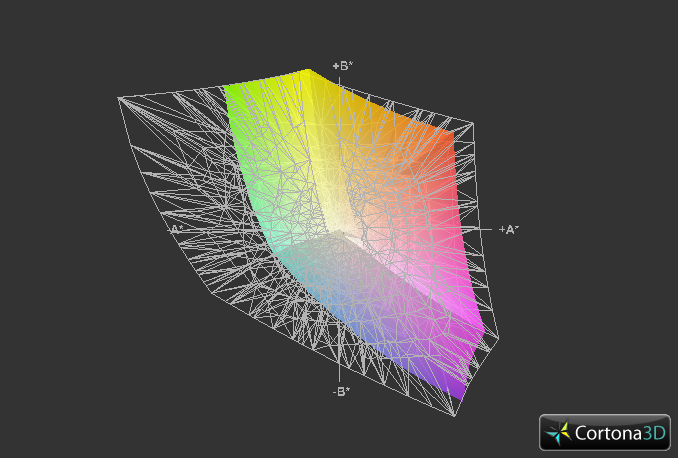 It takes viewing angles of more than 70 degrees for color distortions to begin to occur. 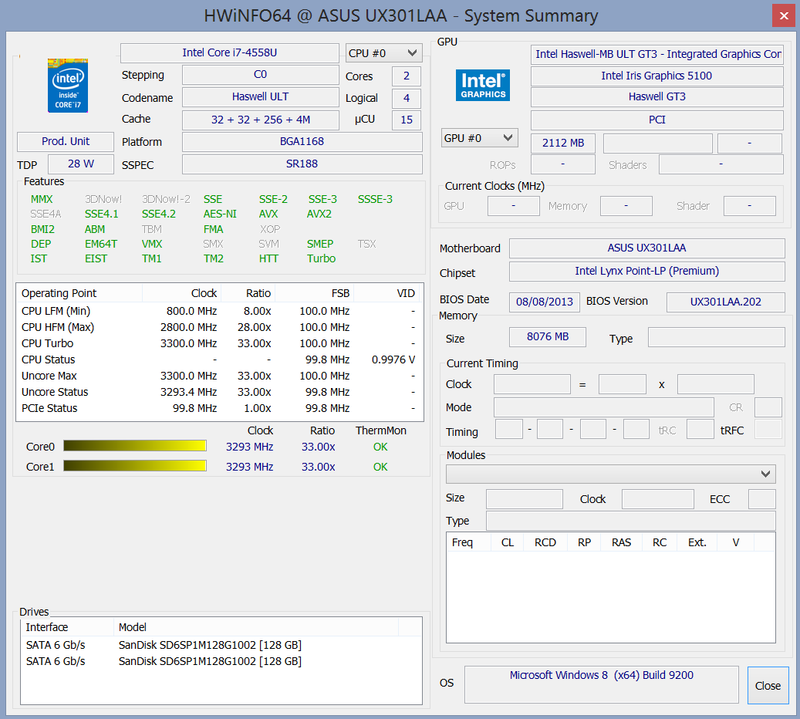 Judging by its name, the Core i7-4558U could be mistaken for an ordinary ultrabook CPU, but this is only partially true. Although the Haswell CPU is based on the exact same chip like for example the i7-4650U of the most recent MacBook Air, it comes with a much higher TDP. Instead of up to 15 Watts, the Core i7-4558U is allowed to sip up to 28 Watts of power, increasing the turbo range to extremely high levels of 2.8 to 3.3 GHz (4650U: 1.7 to 3.3 GHz). Feature-wise, the differences are less dramatic. 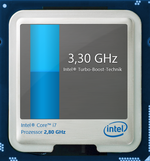 The CPU still supports all the bells and whistles, from Turbo Boost 2.0 to Hyperthreading, AES-NI and the new AVX-2.0 expansion; a few other technologies, most of them only relevant for business computers (vPro, Trusted Execution, Management Engine, TSX-NI) have been deactivated by Intel. Next to its increased TDP, the new 28-Watt variant comes with another peculiarity, shipping with an extraordinarily powerful internal graphics card, Intel's Iris Graphics 5100. More on this (as well as numerous benchmarks) can be found further down in this article. In most countries, the Zenbook UX301 can only be purchased in a single configuration, with 8 GB of RAM and a 256 GB SSD system. 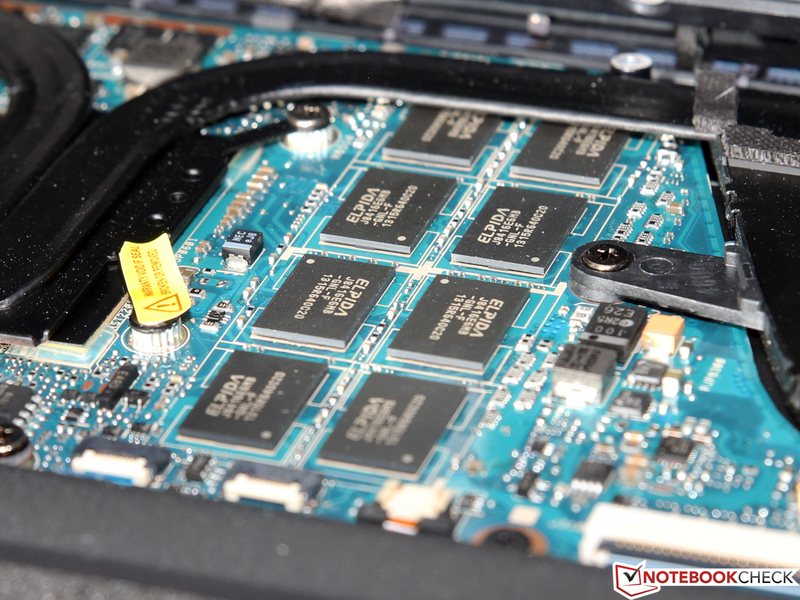 Asus has thought about every detail here: The RAM is not only clocked at a fast 800 MHz (DDR3-1600) but it is also working in dual channel mode (in order to supply CPU and GPU with the maximum possible bandwidth). And there is not one but two fast SSDs that, in a RAID-0 system, are supposed to lead to extreme data transfer rates. 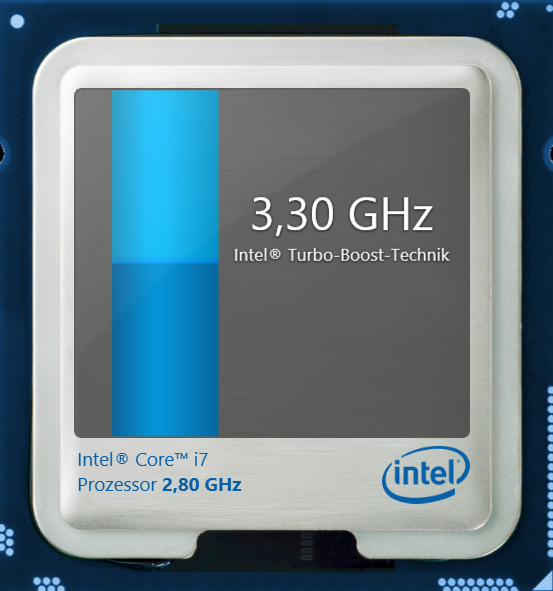 Without the TDP-based constraints put on its ULV siblings, the Core i7-4558U has no problems utilizing its Turbo Boost range to the fullest. Under maximum load on both cores, the clock speed comes to lie between 3.1 and 3.2 GHz while reaching the full 3.3 GHz in single threading applications - no matter whether the laptop is plugged in or not. The high clock speeds in combination with the (once more) improved performance-to-MHz ratio of the Haswell architecture leads to impressive performance levels mostly unmatched by its direct competitors. During the Cinebench R11.5 (64-bit, multithreading) benchmark, the Zenbook manages to take the lead by over 23 percent when compared to the Core i7-4650U MacBook Air (Core i5-4250U: 39 percent). Even the much thicker and heavier MacBook Pro 13 (still running on the older Ivy Bridge Core i5-3210M CPU) fares considerably worse than the Core i7-4558U. 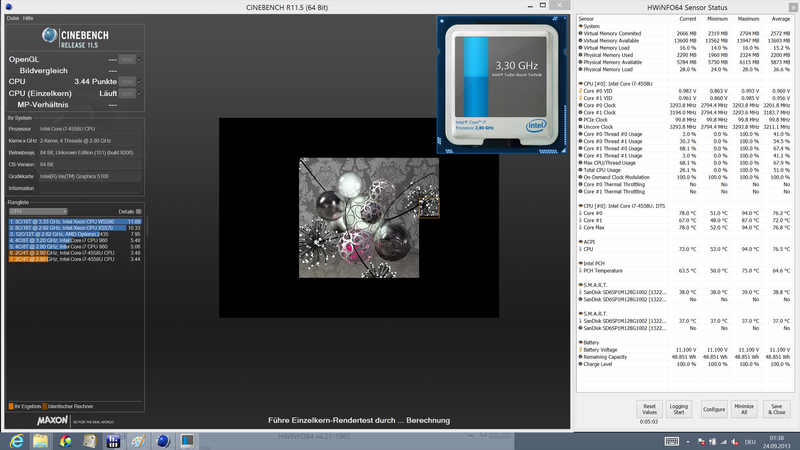 Overall, the new CPU is about as fast as the Core i7-3540M, making it one of the fastest dual-core CPUs on the market. 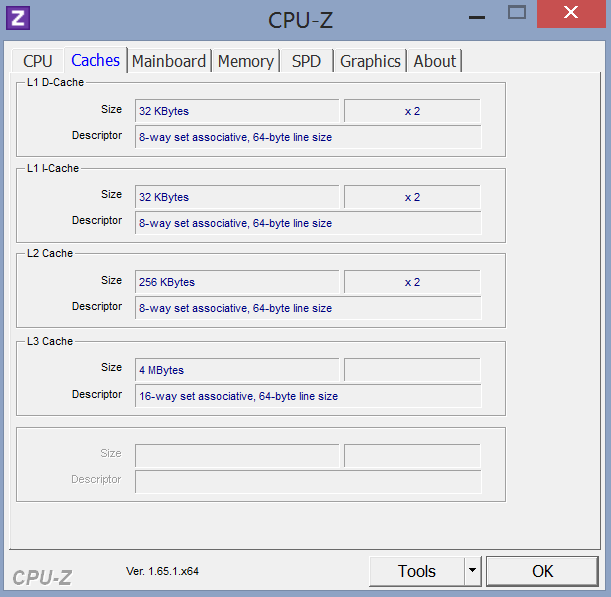 Even more powerful quad-core CPUs can usually be found only in much larger and heavier laptops. 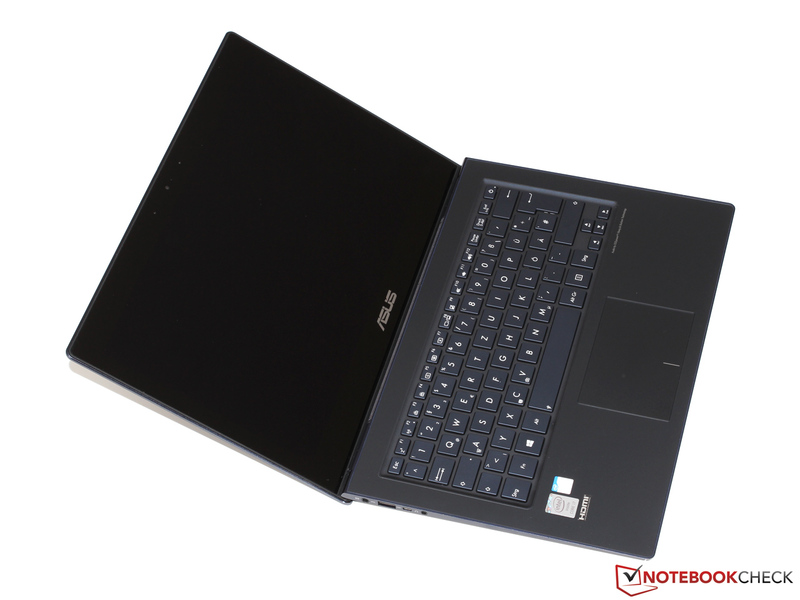 An example would be the Zenbook UX51VZ - its CPU (35 Watts) would barely fit into its sibling's slim 13-inch chassis. As if one SSD was not enough, Asus ships the UX301 with two of these, combining them into a RAID-0 system. Both drives belong to SanDisk's X110 series (SD6SP1M-128G), but they are built according to the unusual PCIe format M.2/NGFF 2260 instead of the usual mSATA standard. Apart from this (and the fact that it uses 19 nm technology and MLC flash storage), not much can be learnt about the chip manufacturer or the type of controller. However, this is not the most important aspect for most potential buyers. Performance is. 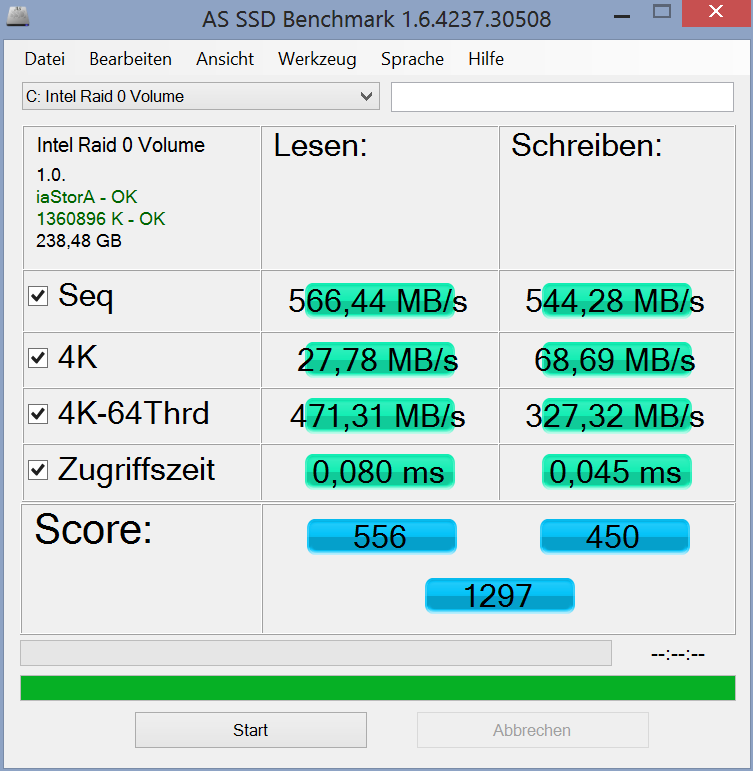 With sequential read speeds of 560 to 910 MB/s and write speeds of 540 to 590 MB/s, the results sure are impressive. Few other laptops have achieved similar data transfer rates. We were also quite impressed by the drives' 4K performance, even though a RAID-0 system does not offer many advantages in such a scenario (cue: chunk sizes). The PCMark system performance benchmarks profit tremendously from high CPU and SSD performance levels, explaining the extraordinarily high results of the UX301LA. 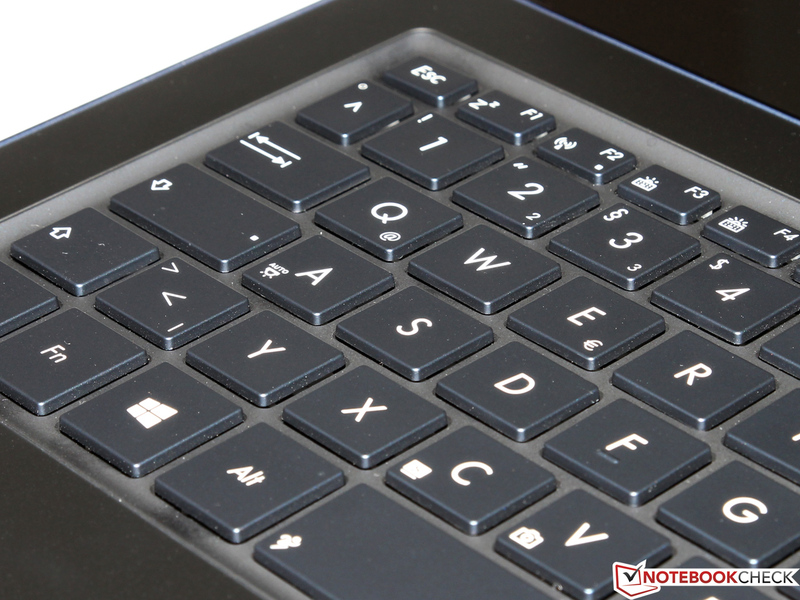 Neither the various MacBook models nor ultrabook competitors such as the Sony Vaio Pro 13 even come close. 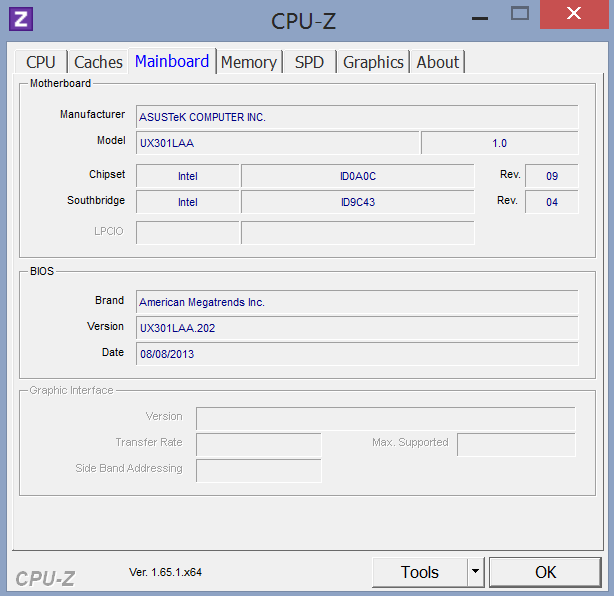 Still, PCMark is "just" a synthetic benchmark without too much real-world significance. But its results hold true during our subjective tests. Everything felt zippy at all times: Booting up, starting programs, loading data, installing apps - the CPU performance alone should be sufficient for even the most demanding users. In contrast to the mobile Ivy Bridge lineup with its two integrated graphics solutions, a much larger variety of Haswell-based integrated GPUs exist. The following table might help in gaining an overview over the six major variants. The least power-hungry ULV processors with a TDP of 15 Watts come with three different GPUs, ranging from the low-end variant HD Graphics (Haswell) to the HD Graphics 4400 and the HD Graphics 5000. The Iris Graphics 5100 used in the Core i7-4558U is closely related to the latter. Both sport 40 execution units (EUs), comparable clock speeds and - a major difference when compared to the Iris Pro - no dedicated eDRAM memory. Again, the TDP makes the main difference: Thanks to an increased thermal design power, the Turbo Boost can be used more to its fullest, resulting in increased performance levels. This is especially true when the CPU is taxed at the same time. 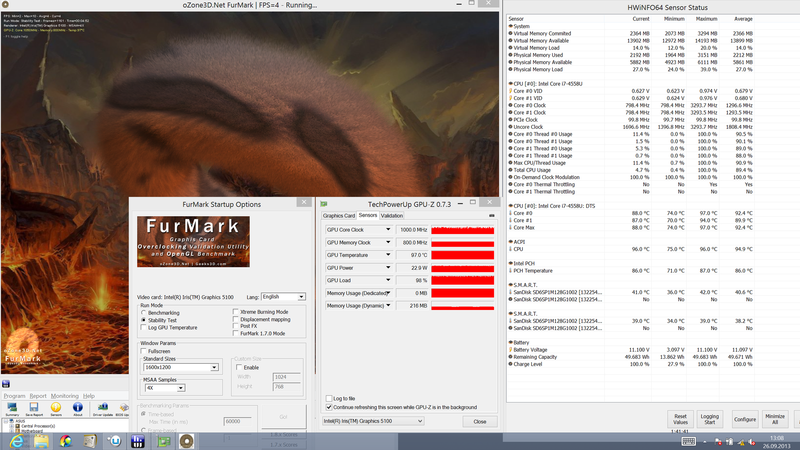 Still, the 1279 points in 3DMark 11 (GPU score, "performance" preset) of the Iris Graphics 5100 is just 20 percent more than what the HD 5000 managed to yield. 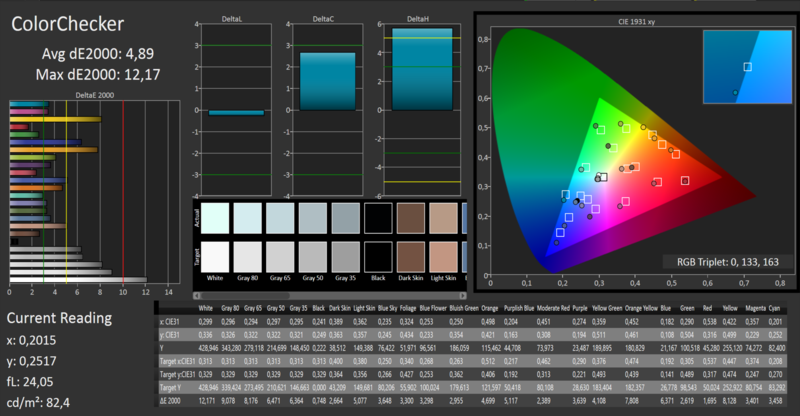 We would have expected a larger difference, especially since the Iris Pro is faster by more than 50 percent. Obviously, the GPU is strongly limited by the narrow main memory bandwidth - even though 3DMark 11 does not even have a reputation of being particularly bandwidth-hungry. When compared to dedicated graphics cards, the Iris Graphics 5100 is approximately on par with a GeForce GT 640M LE or a Radeon HD 8570M. 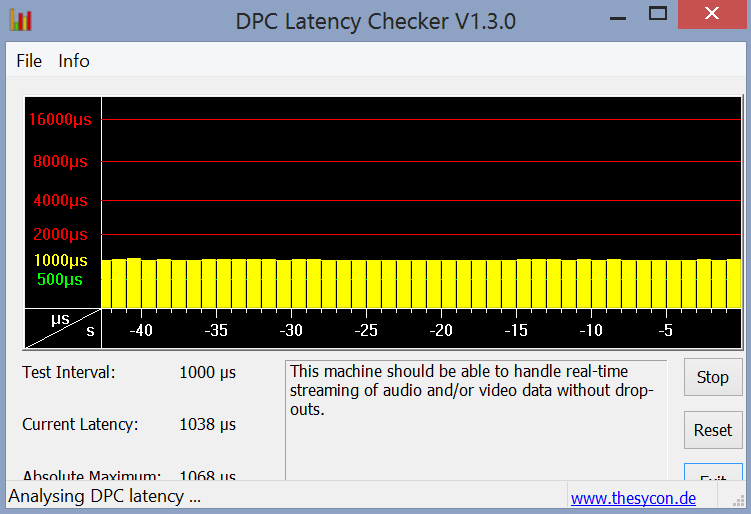 The bandwidth-induced performance issues are even more pronounced in games. Again, the Iris Graphics 5100 is only 20 percent faster than the HD 5000 while now trailing the Iris Pro by more than 70 percent. The HD Graphics 4400 fares surprisingly well (barely falling behind) despite its inferior graphics prowess - another hint that the main problem might be located elsewhere. 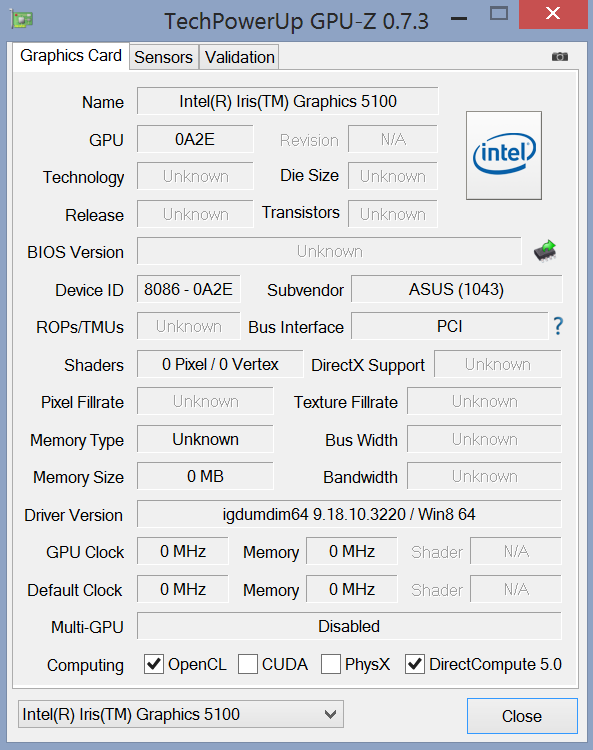 Although this does depend on the actual games in question, the performance of the Iris Graphics 5100 is usually only sufficient for medium settings and a resolution of 1366x768 pixels, barely pulling ahead of the GeForce GT 620M used in the UX32VD. In addition, we have had some issues with the graphics driver: Battlefield 3 crashes (a reproducible event) and Bioshock Infinite as well as Splinter Cell will not even start when everything is set to maximum. The worst problem was the missing fullscreen scaling feature in approximately every fourth game we tried - an image of 1024x768 pixels with huge black borders looks ridiculously small on a 13-inch WQHD screen (think smartphone-sized). Hopefully, an upcoming driver update by Intel will solve these issues. 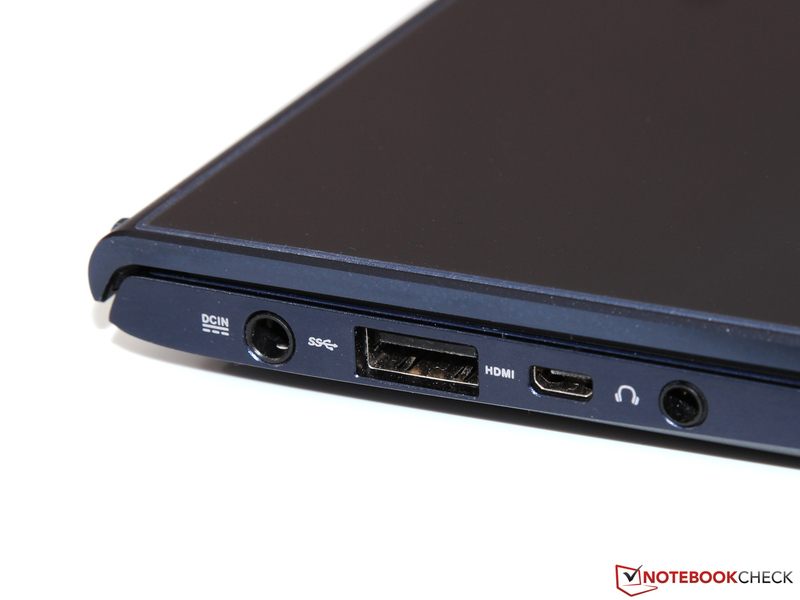 The Zenbook sports not only one but two small fans. Thanks to an efficient energy-saving scheme, these are rarely active while the laptop is idle. In combination with the silent SSD drives, we are measuring no more than 29.0 to 31.3 dB(A) - noise levels that do not increase while performing simple office or multimedia tasks. The noise levels under full load are just as admirable. 39 db(A) is as quiet as the MacBook Air - even though the Zenbook comes with far more powerful innards. The steady, low-frequency noise feels more than acceptable. 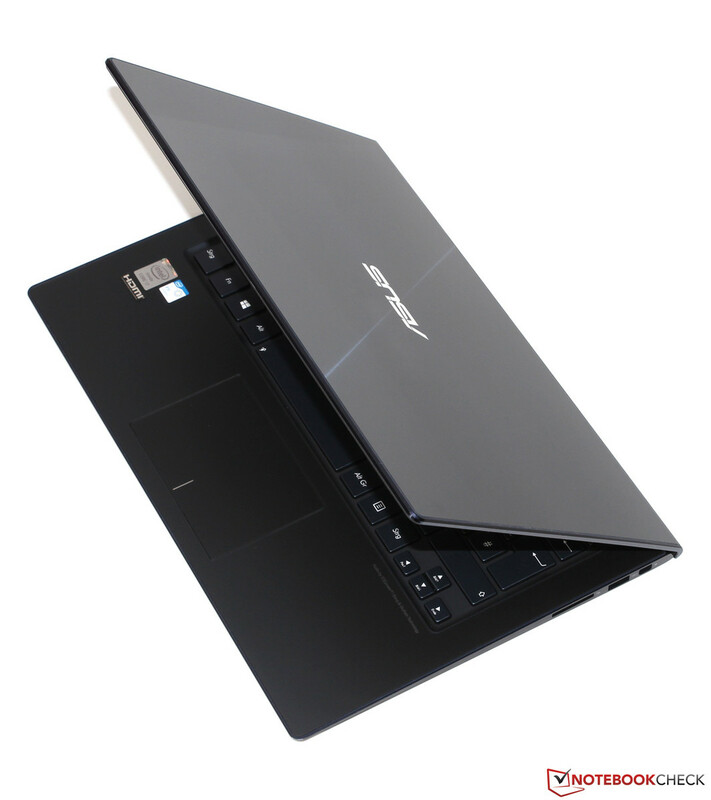 Although the Zenbook is usually a passively cooled device during simpler tasks, its surface temperatures remain pleasantly low, even near the fan vents. 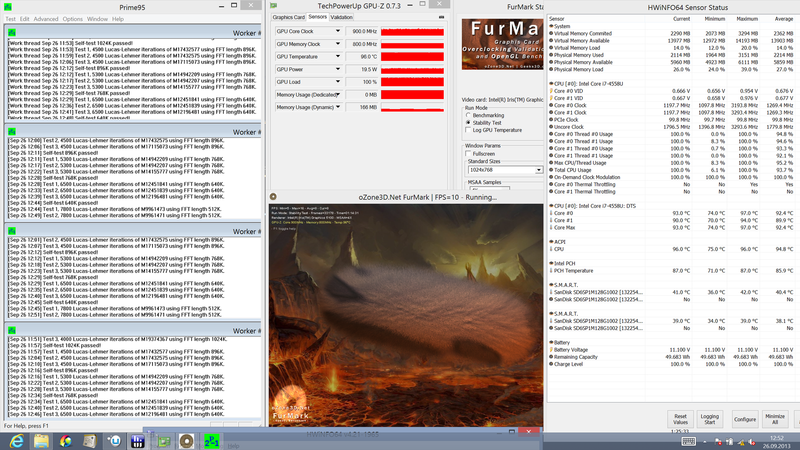 Some hot spots close to the rear end of the device do develop under continuous full load (Prime95 plus FurMark); possibly even exceeding 50 degrees Celsius (122 degrees Fahrenheit). However, the palm rest as well as the majority of the keyboard area remains much cooler so that the high temperatures are not as much of a problem as they could be. Under extreme conditions such as simulated by our stress test, it becomes evident that a CPU with a TDP of 28 Watts within such a small chassis does not come without its problems. 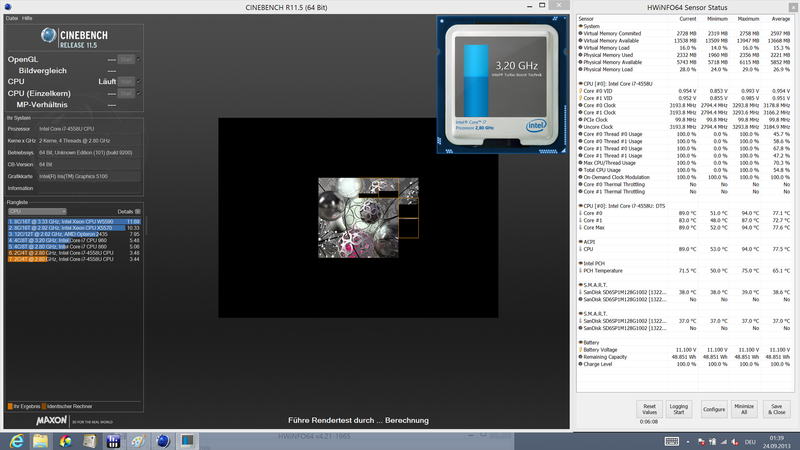 Despite the CPU throttling down to just 1.2 GHz after a few minutes - done so in order to increase the power budgets which get allocated to the GPU -, the chip gets hot; more than 90 degrees (194 Fahrenheit). The GPU stays at 900 MHz, only slightly less than what it manages to reach in most games. Talking about games: During actual usage scenarios, such extreme throttling issues should not be possible. 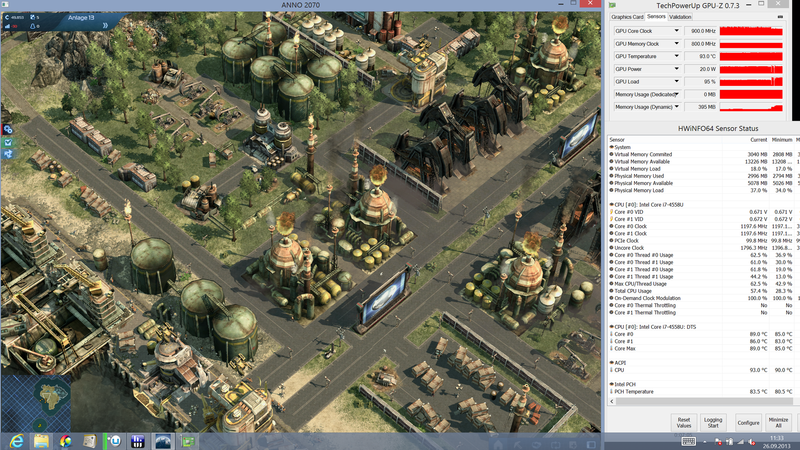 Even when we were running Anno 2070 and the Cinebench R11.5 benchmark simultaneously (! 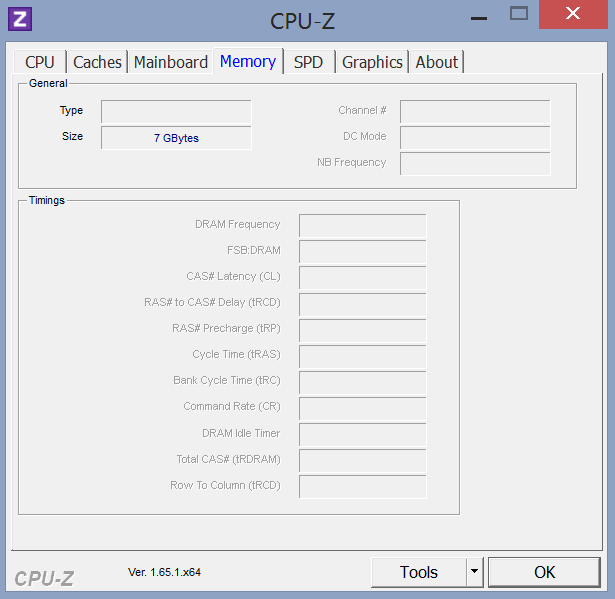 ), clock speeds of 2.4 GHz and 900 MHz (CPU and GPU, respectively) were reached, much more than what any "normal" ULV processor with a TDP of 15 Watts could deliver under these conditions. At first glance, the stereo speakers - which have been developed in collaboration with the Hi-Fi specialists Bang & Olufsen - seem to disappoint, yielding indistinct sound and almost no lows at all. Still, some fine-tuning (done with the supplied driver which does not only allow us to select a number of different profiles but also to re-adjust lows and highs according to one's own liking) led to more convincing results, especially in terms of maximum loudness. Yet, even after these readjustments, these are not the best speakers we have ever reviewed. Of course, thanks to the Line In/Out port and the digital display ports, it is always possible to use external speakers and headphones. 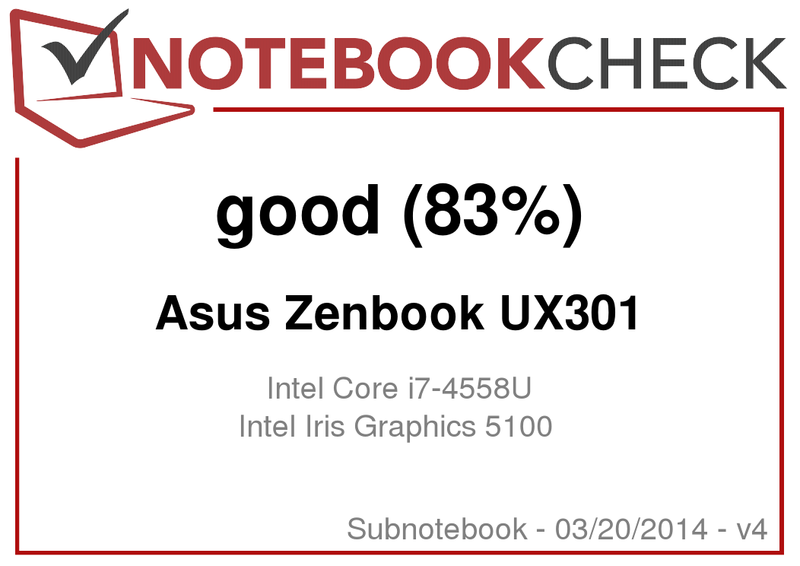 While idle, the Zenbook UX301 requires approximately 4.5 to 7.5 Watts - no more than most of its competitors, although it does not get quite as good as the phenomenal minimum power consumption of 2.8 Watts of the MacBook Air 13 under OS X. As expected, the power consumption increases sharply under full load, with up to 52.2 Watts during 3DMark 06 "thanks" to the fast CPU while Apple's laptop contented itself with 36.9 Watts. Still, due to the much brighter, sharper display and the far superior performance levels of the UX301, this extra consumption feels adequate. Interestingly, the Zenbook requires a little less than these 52.2 Watts during our stress tests due to the throttling issues. Great stamina not only requires modest power consumption levels, but also a large battery. 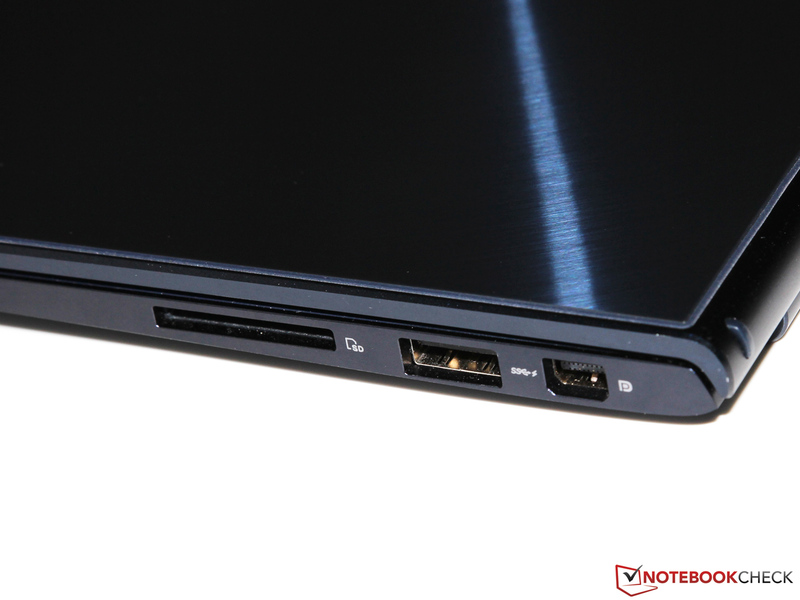 The UX301LA has this area covered: 50 Wh is a mid- to high-range value for ultrabooks. During the Battery Eater Reader's Test (energy-saving mode, minimum brightness, Wi-Fi deactivated), the laptop manages to stay alive for 8:56 h - a good, but not great result which surpasses the older UX32VD by approximately two hours while falling short of both the Vaio Pro 13 and the MacBook Air 13. Similar results hold true during our Wi-Fi test (energy-saving mode, screen set to ~150 cd/m²): 6:25 h does beat the Vaio (5:16 h), but then again, Sony's laptop has to work with a much smaller 37 Wh battery. The MacBook offers more than 10 hours of battery life thanks to its extremely efficient usage of its resources. Under full load (Battery Eater Classic Test: maximum performance, maximum brightness, Wi-Fi on), the powerful CPU - which retains its full speed even while running on battery - spells doom for the runtime. Under these conditions, it takes only 55 minutes for the battery to be drained. The laptop takes 2 hours to recharge. Our expectations were high - and we were not disappointed. 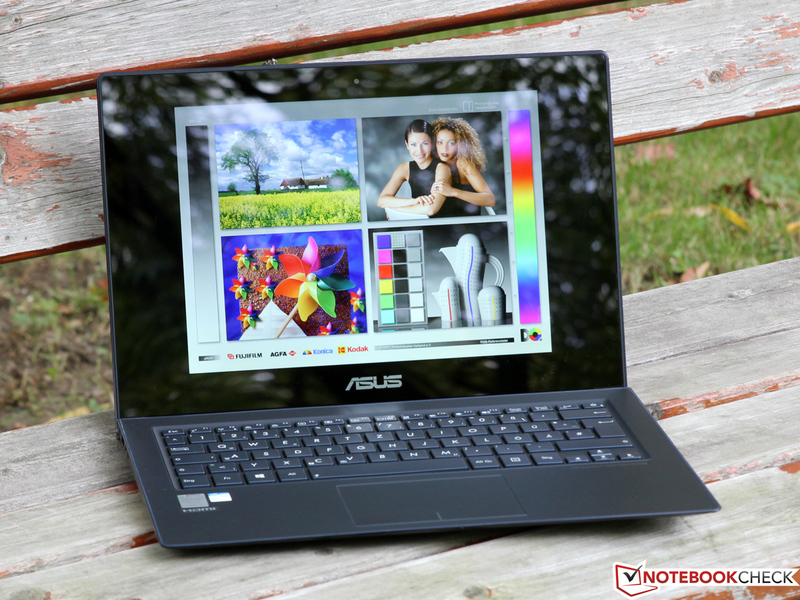 Right now, the Zenbook UX301LA truly is one of the best ultrabooks on the market. 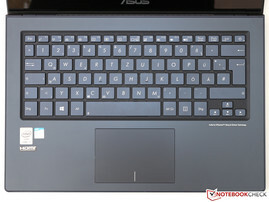 However, Asus does not just copy the competition in order to corroborate the reputation of its newest Zenbook. It shines (in the true sense of the word) with its own original ideas: This is the first laptop we have reviewed where Gorilla Glass has been used on many more parts than just the display itself - we are especially fond of the excellent haptics of the matte polish used on the palm rest. Gorilla Glass 3 should not only be less vulnerable than many other materials, it also helps (together with first-class input devices) to boost the top-notch feel and look of the device. The superb IPS display is another huge advantage when compared to some competitors. 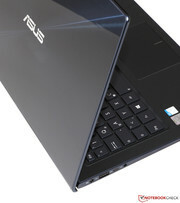 Image quality is good, but it is the insane resolution where the Zenbook truly shines. Then again, this choice demands a lot from the graphics card. 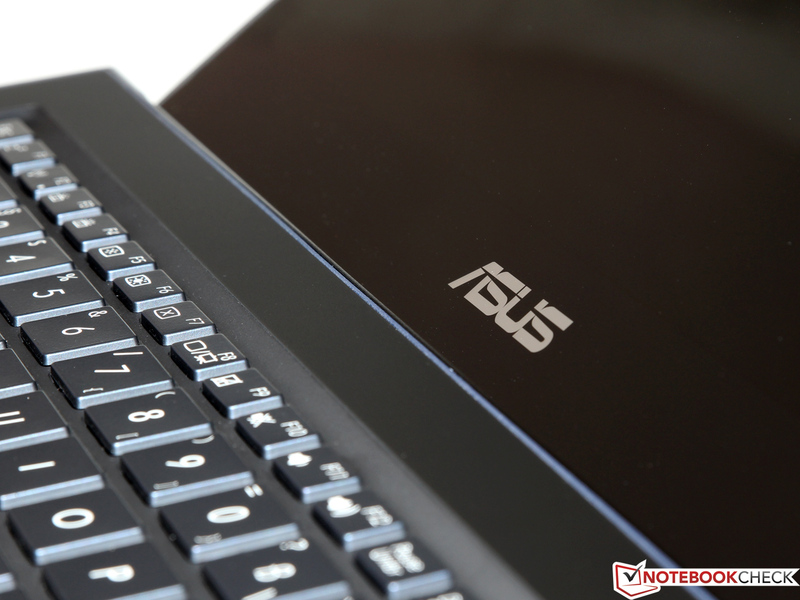 Luckily, Asus has chosen to ship its newest Zenbook with the Iris Graphics 5100 chip. Even though it might not be the giant leap ahead we had hoped for, it is still fast enough to handle most recent games with medium details. Gamers might want to wait for the sibling UX302, which comes with a dedicated GPU made by Nvidia. 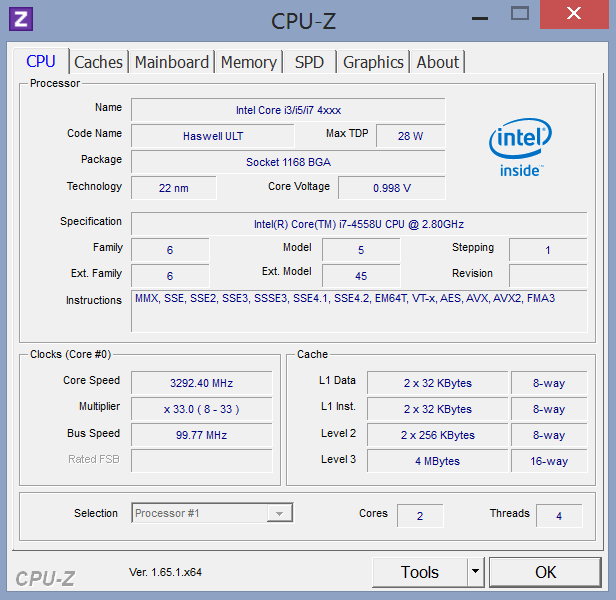 The main advantage of the Core i7-4558U when compared to even less power-hungry ULV chips is its decidedly better CPU performance. 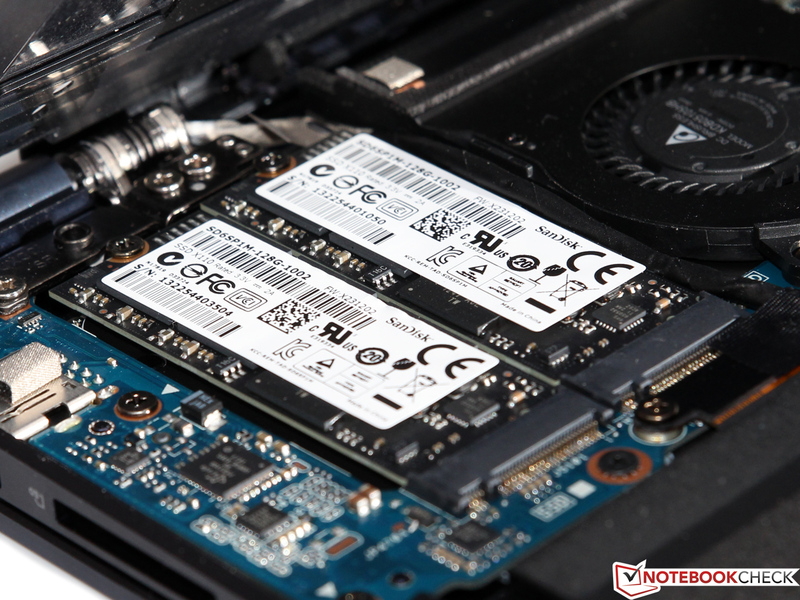 Thanks to its SSD RAID system, the ultrabook should be powerful enough to handle even demanding applications. It is not all roses, though. Thankfully, none of our points of criticism could be called a deal breaker. Naturally, a 28-Watt CPU will require some power, leading to somewhat diminished battery life, but we feel that this limitation is outweighed by its jump ahead in terms of performance. Other details - such as the mediocre webcam - could have been handled better, but again, this does not seem crucial. Thus, we are fondly looking forward to how the upcoming products of the competition will fare, such as the next generation of the MacBook Pro 13, which will likely be revealed this fall. ...not matter from where we look. ...only comes with the best of the best (in terms of both components and build quality). ...have been coated with extremely robust Gorilla Glass. Beneath, a sturdy aluminum frame has been used. 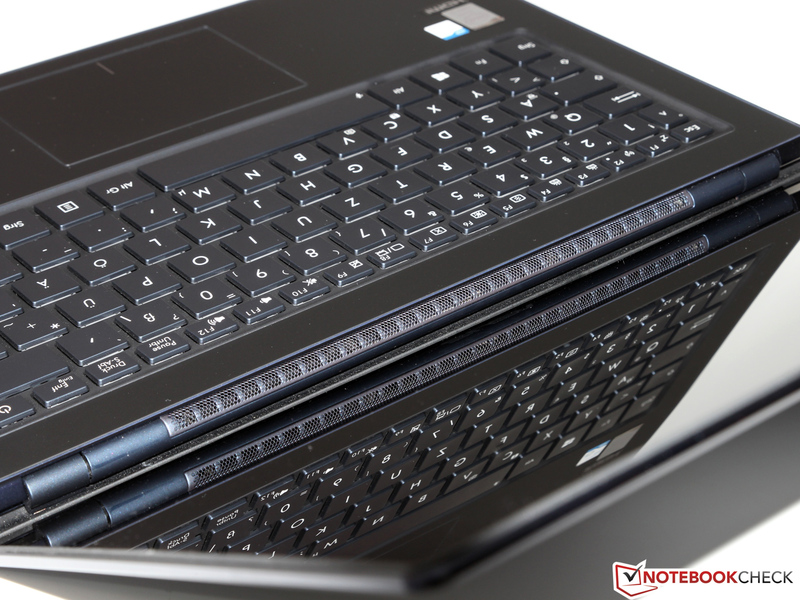 ...is rather short, as is typical for ultrabooks. ...for VGA and Gigabit Ethernet. ...also serving as a base for the laptop. 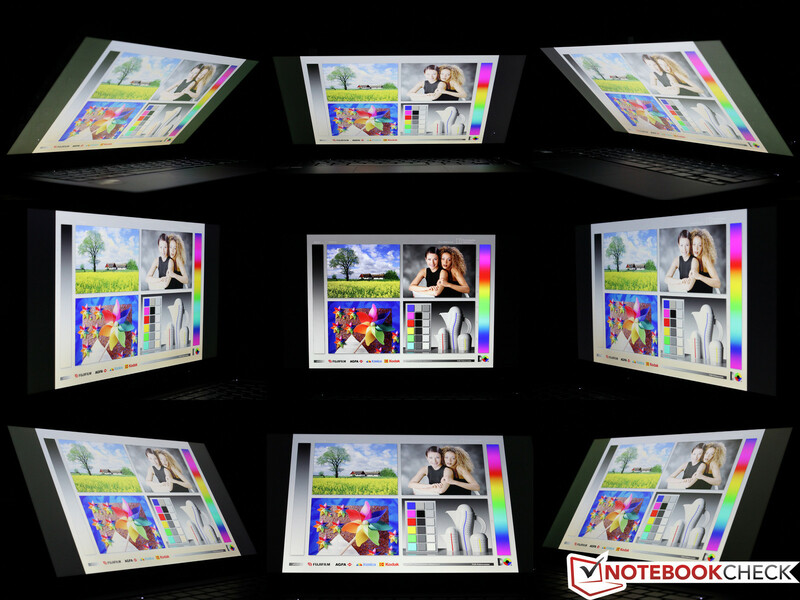 The reflective display comes with an insane resolution of 2560 x 1440 pixels. ...are surprisingly well-suited even for prolonged work sessions. The glass touchpad works just as well. Quite a name, especially for Hi-Fi fans. And indeed, after some optimizations, more-than-decent audio quality can be reached. 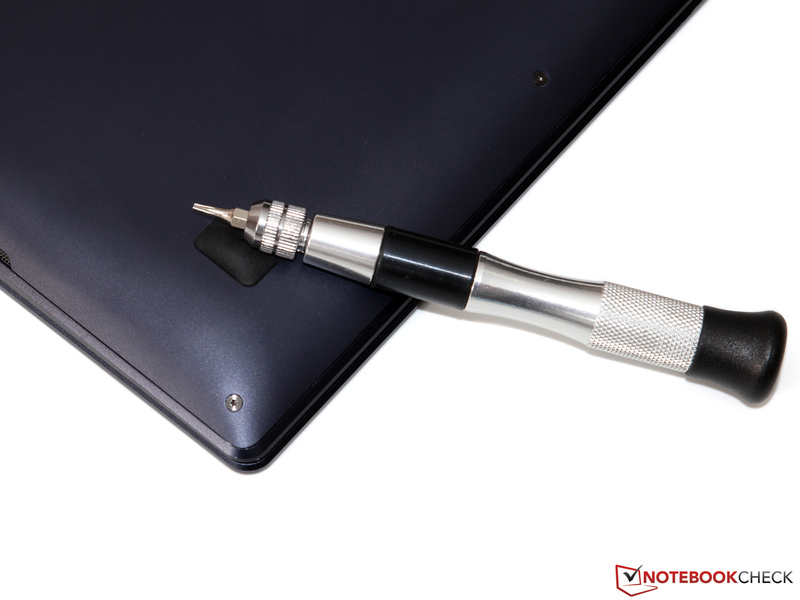 ...the Zenbook can be opened (with the right tools). ...and the SSDs come in an unusual form factor. The Wi-Fi module could be swapped, but it is already one of the best. 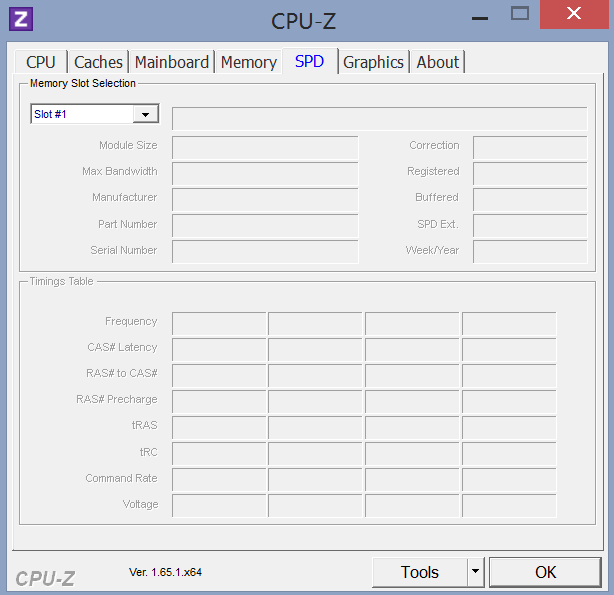 ...ensures that the Zenbook never runs out of power. Great-looking, fast and highly mobile - the newest Zenbook packs more punch than some full-sized desktop replacement systems, and it does so within a tiny package. Its build quality is absolutely top-notch. Not that much, actually - except for a lower price point. 1800 Euros is almost on par with a similarly-speced MacBook Pro 13 with Retina display. Although the Iris Graphics 5100 is very fast given that this is just an integrated GPU, it is not much faster than an HD Graphics 4400 or an HD Graphics 5000, being more or less on par with (just) a dedicated GeForce GT 620M. Most comparable devices come from Apple, ranging from the more mobile MacBook Air 13 to the more powerful MacBook Pro 13 Retina. 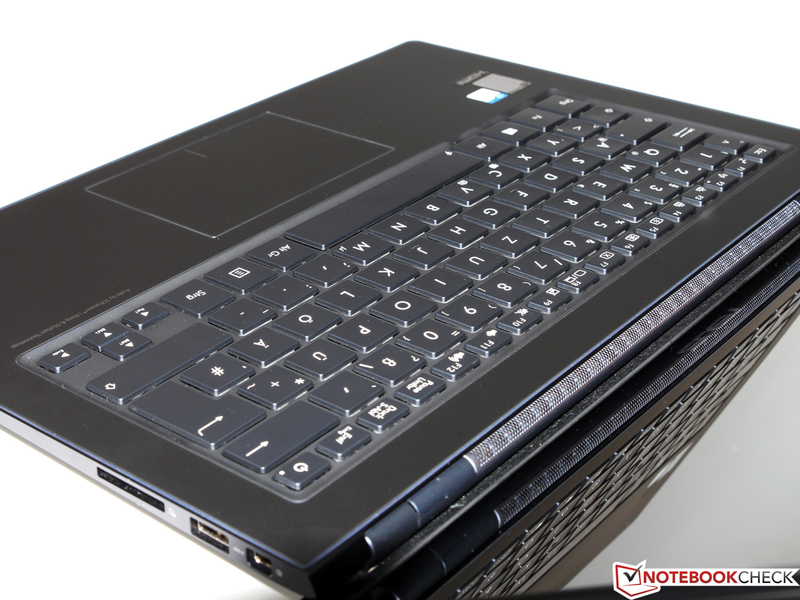 Other alternatives might be the Samsung 740U3E, the Sony Vaio Pro 13, the Acer Aspire S7 or the Dell XPS 12.